As mentioned above, SolarCity is having an incredible day in the market today after making a key announcement. The company announced that it is testing its solar power system on the Hawaiian island known as Kauai. In the announcement, SCTY stated that it has already started to implement its new dispatchable solar plus storage integrated utility product on the island over the past week. The overall hope is that the new technology will replace the regions reliance on fossil fuels, making Kauai a green energy island! One of the first things that investors learn when they get started in the market is that the news causes moves. Ultimately, when positive news is released with regard to a publicly traded company, we can expect to see gains in the value of the stock associated with that company. On the other hand, negative news will lead to declines. When it comes to SCTY, the news that was announced today was overwhelmingly positive. So naturally, we’re seeing gains in the value of the stock today. Currently (2:37), SolarCity stock is trading at $23.94 per share after a gain of $2.00 per share or 9.12% thus far today. Moving forward, I have an overwhelmingly bullish opinion of what we can expect to see from SCTY. While it’s great to see that the company is moving into Hawaii, this is not the reason that I’m so bullish on the stock. Unfortunately SolarCity has been dealing with downward movement for quite some time now, and they haven’t been the reason for the declines. You see, the solar industry was recently shocked when Sunedison announced that it has made the decision to file bankruptcy. As a result, investors have been digging deep into the financial data offered surrounding other solar stocks, and they have found one similarity. The reality is that SCTY does have quite a bit of debt. However, I have to say that I’m not concerned in the least about the debt. The problem has already been solved. To understand, you have to understand where the debt came from. 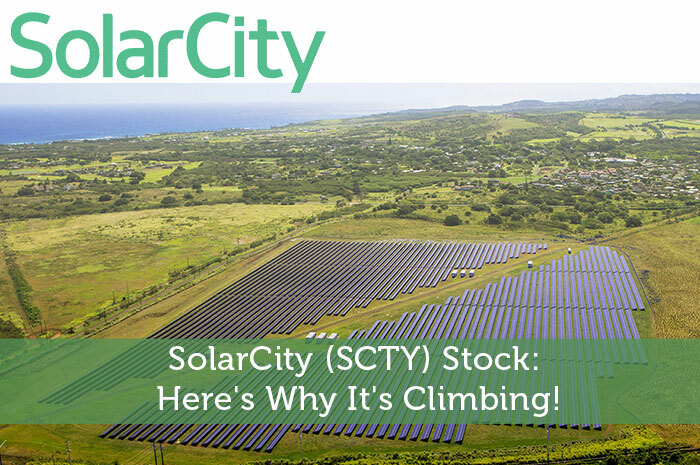 SCTY isn’t like Sunedison. While Sunedison is focused on building solar power plants, SolarCity is focused on bringing the control of solar power to the consumer. However, consumers don’t generally have the amount of money needed to install solar systems laying around. So, SCTY started offering payment plans and covering the initial setup costs by taking out debt. Nonetheless, this has come to an end. At this point, SCTY realized that it doesn’t have to take on the risk associated with this business model through debt. Instead, the company has started to securitize solar projects, which gives them the money they need and passes the risk down to the investors in the projects. So, the debt is not a concern. What I see here is a company that has built an incredible name for themselves and puts the power of generating solar electricity in the consumer’s hand. All in all, it seems as though SCTY is headed up from here. Where do you think SCTY is headed moving forward and why? Let us know your opinion in the comments below!